At age 19 Jonna Tamases is a student and aspiring stage performer. She has oversized breasts that she wants to reduce. During her checkup with the doctor for a breast reduction she discovers she has cancer. In Canada, an estimated 22,700 women in Canada will be diagnosed with breast cancer. That is 437 women diagnosed every week. One in nine Canadian women will develop breast cancer in their lifetime. One-third of these women will die. Jonna Tamases’ experience with cancer was presented on the big screen in her film Jonna’s Body, Please Hold. It was showcased at the second annual BreastFest in Toronto. When Tamases was diagnosed with Hodgkin’s disease at age 19, she recalls, “I was pretty angry…I couldn’t conceive what it meant to be facing death.” The next year, she found out she had large cell lymphoma. “Luckily in my case, the chemotherapy worked and the cancer died before I did,” she said. Twelve years later, she found out she had breast cancer. “I suspect it was due to the radiation that I had in the area to treat the first cancer,” she said. Often secondary cancers appear in areas that were previously radiated. She opted for double mastectomy instead of chemotherapy. “Chemotherapy was really hard for me, it was very intense and I was not looking forward to having to go through that again,” said Tamases. She also didn’t like the idea of waiting and seeing, and wanted to move on with her life. Tamases’ story and others are featured as part of Breastfest—the world’s first film festival dedicated to breast cancer awareness. It took place in November at Toronto’s Royal Ontario Museum. 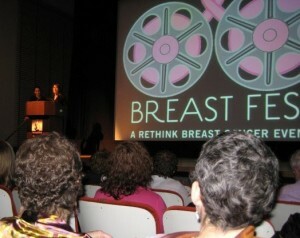 Breastfest explores the spectrum of issues surrounding breast cancer through films, panels, workshops and speakers.